The length of a box is 3 times the width. Which of the following gives the length (L inches) in terms of the width (W inches) of the box? When reading word problems, there are certain clues that help interpret what is going on. The word “is” generally means “=” and the word “times” means it will be multiplied by something. Therefore, “the length of a box is 3 times the width” gives you the answer: L = 3 x W, or L = 3W. The width of a box, in inches, is 5 inches less than three times its length. Which of the following equations gives the width, W inches, in terms of the length, L inches, of the box? We notice the width is “5 inches less than three times its width,” so we express W as being three times its width (3L) and 5 inches less than that is 3L minus 5. In this case, W is the dependent and L is the independent variable. Angie is painting a 2 foot cube for a play she is in. She needs of paint for every square foot she paints. How much paint does she need? It is impossible to convert between metric units and feet. 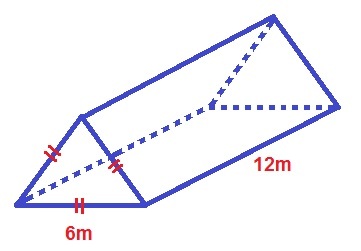 Find the surface area of the following triangular prism. 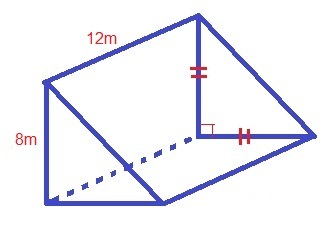 Where is the length of the triangle side and is the length of the height. David wants to paint the walls in his bedroom. The floor is covered by a carpet. The ceiling is tall. He selects a paint that will cover per quart and per gallon. How much paint should he buy? Find the surface area of the walls: SAwalls = 2lh + 2wh, where the height is 8 ft, the width is 10 ft, and the length is 16 ft. This gives a total surface area of 416 ft2. One gallon covers 300 ft2, and each quart covers 75 ft2, so we need 1 gallon and 2 quarts of paint to cover the walls. A box is 5 inches long, 5 inches wide, and 4 inches tall. What is the surface area of the box? The box will have six total faces: an identical "top and bottom," and identical "left and right," and an identical "front and back." The total surface area will be the sum of these faces. Each of these faces will correspond to one pair of dimensions. Multiply the pair to get the area of the face. Substitute the values from the question to solve. What is the surface area of a rectangular brick with a length of 12 in, a width of 8 in, and a height of 6 in? What is the surface area of an equilateral triangluar prism with edges of 6 in and a height of 12 in? The surface area of the prism can be broken into three rectangular sides and two equilateral triangular bases. The area of the sides is given by: , so for all three sides we get . The equilateral triangle is also an equiangular triangle by definition, so the base has congruent sides of 6 in and three angles of 60 degrees. We use a special right traingle to figure out the height of the triangle: 30 - 60 - 90. The height is the side opposite the 60 degree angle, so it becomes or 5.196. The area for a triangle is given by and since we need two of them we get . Therefore the total surface area is . American University, Bachelor of Science, Applied Mathematics.